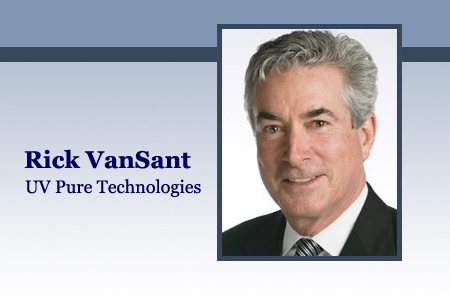 By Rick VanSant, President & CEO, UV Pure Technologies, Inc. The global market for water treatment technologies is growing and becoming increasingly important as the quality and quantity of freshwater sources are stressed and the link between fresh water sources and wastewater — returned to the environment — is more and more obvious. Estimates for the global water treatment market (infrastructure, O&M, and technology) are $800 billion today, forecasting $1.4 trillion by 2020, or a compound annual growth rate (CAGR) of about 8%. We estimate the technology segment at 10% of the overall market ($80 billion) growing at 12% CAGR and as high as 15% for leading technology like UV treatment systems.